Ryozo Tatami, the mayor of a small town in Kyoto prefecture, was delivering a speech Wednesday before an exhibition sumo match when he suffered a brain hemorrhage and collapsed, according to the New York Times. Even though women comprise a large part of the sumo fanbase, they’re forbidden from entering the ring itself. 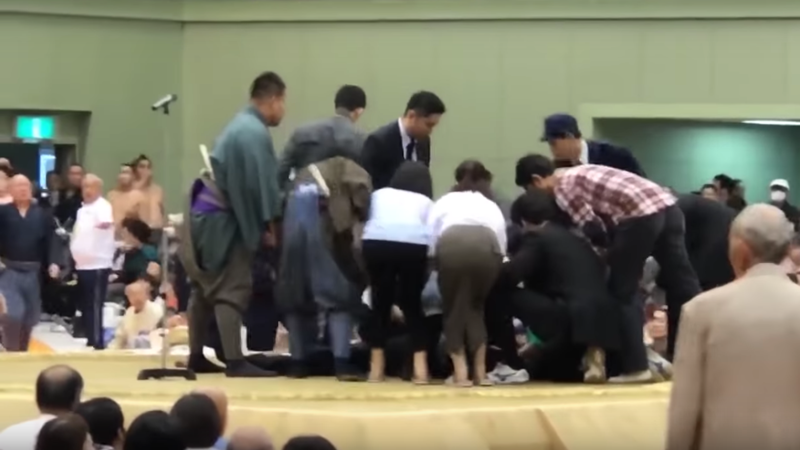 That’s why one particularly insistent sumo referee tried to oust several women who had rushed to Tatami’s side in this video of the widely criticized incident. Although the no-women rule has since calcified into blind tradition, one historical theory holds that it was meant to prevent Shinto goddesses of the harvest—once the intended audience of sumo bouts—from getting jealous and ruining the next harvest. A female nurse was willing to risk incurring the goddesses’ wrath to administer CPR on Tatami, who is reported to be in stable condition after surgery. How Long Does It Take To Become A Yokozuna Sumo Wrestler?